Today is the day we are supposed to launch the boat. Finally, we could be off of "the hard" (what us sailors call it when a boat is intentionally put on land...where it obviously isn't supposed to be) where the boat sits in the air, acting as a solar oven while surrounded by trees that block even the slightest of breeze. Where Rover started the day. But first, we needed to touch up a bit more bottom paint. When a boat is put on the hard, it is sitting in the air on blocks or stands. When the bottom paint is as thick as it is on our boat (yes, at some point we need to do a full strip and repaint...but I'd like to get another year or two out of it first), the blocking can actually stick to chips of the paint and pull them off of the hull. This may also have something to do with the original surface prep, but in any case, it seems to happen. So, early this morning the Travelift operator showed up to pick the boat up off the blocks so we could touch up those areas. Hanging in the Travelift slings, we cleaned and touched up areas under the blocks and bottom of the keel. Now, the Petit Hydrocoat paint we are using typically wants 12 hours or more to dry, but we were scheduled to go in between two and three...so hopefully it will dry enough in time. Thus far I've liked the Petit Hydrocoat paint, the boat has remained pretty clean and there are no noxious fumes from the paint. The only negative I've found so far is that it takes a while to dry, and getting the yard to give me enough time to allow the paint to dry while off the blocks (they prefer hanging in the Travelift slings to re-blocking a catamaran it seems) is near impossible. With the paint applied and drying, we headed out to breakfast. Since the boat was swinging in the lift, we figured we should probably limit any time on board to only absolutely necessary...and going out for breakfast seemed like a good option. After breakfast and taking the dogs for a walk at a nearby park, we returned to the boat. 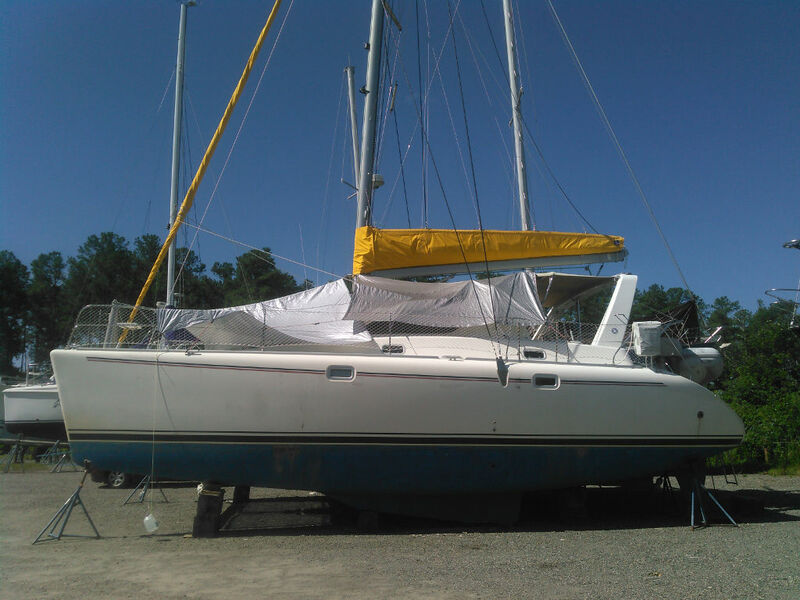 We decided to apply some wax to the hull at the waterline (we started waxing the whole hull a day or two ago, but ran out of time after one side of one hull), since it is easier to do on land than floating in a dinghy. We hand applied wax to the bottom 8 inches or so of bare fiberglass. By the time we were done, it was almost time to go back into the water. 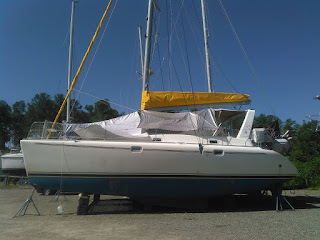 We quickly went around the boat, removed the tarps we had put up to help shade us from the sun, and set up dock lines and fenders so we could be moved out of the haul-out slip and over to the slip we will call home while I work on the hard top. The lift operator arrived while we were getting the tarps put away, so we felt a bit rushed. This turned out to be a bad thing. The boat made its slow roll from the yard to the haul out pit. The boat was slowly lowered into the water and as soon as I was allowed, I hopped on board and started inspecting the through hulls to make sure none were leaking. I started with the starboard engine room as there were two down there and the access is through the hatch in the sugar scoop. They looked good when closed, so I opened them up and there were no leaks. Then I went inside. As soon as I got through the door I could hear running water. Oh crap. I quickly followed the sound to the starboard holding tank cabinet and I knew what the problem was. I opened the cabinet door and found the valve in the half-opened position that I left it in when I installed it. In our hurry to get the boat going, I forgot to go through and check each of the through hulls. Since we had two through hulls that were not connected to hoses yet, we basically had two big potential holes in the bottom of the boat. I quickly shut off the valve and the leak was stopped, but not until about three buckets full of water made its way into the bilge. Good thing it didn't take too long to find. Fortunately, after shutting off the valve, no other leaks were found. I burped the prop shaft seals to remove the air and allow water to cool the seals and then it was time to start the engines. The engines fired right up. We made our way out of the haul-out pit and over to the narrow fairway leading to the slip. It was a tight fit but we made it into the slip without incident and are finally back in the water. Rover at the end of the day. Much better. In the slip there was even a nice evening breeze so we were able to open up the boat. It is soooooo nice to be back on the water and not stuck in the hot, dusty, breeze-less boatyard. So, maybe tomorrow I'll go back to the yard and set up my work area for the top...or maybe I'll take a day off. 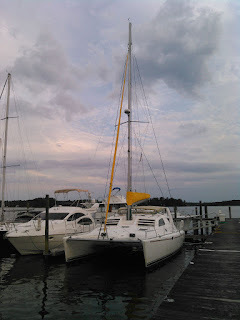 Note: The last two posts were a day or so behind due to internet access issues...yes, in the marina/yard. Seems marinas are difficult places to implement WiFi with all the boats that have repeaters blasting away at full power. Sounds like a checklist, a la airplane, needed before launch. On another note, know that one of the reasons for your hardtop bimini is for solar panel location and electric generation. Recently read a few articles on drive shaft generators (pulley on drive shaft plus belt and generator with smaller pulley attached nearby) Minor amount of electrical items (diodes) to bring electic to 12v dc for charging batteries . Output in the 5-10 amp range depending on boat speed. Only works if you let propeller free wheel while sailing. One setup had elec operated clutch on generator pulley while other just selected generator that would not be harmed by fast turning engine driven shaft. Generator around $270 at a website. Just a thought. Saw Mike (ZTC) mention his new boat had one of those systems. While I've heard my shafts spinning along nicely under sail above 5 knots, there is one thing that would be problematic. My 90/10 rule. My rule is that the boat is 10% transportation and 90% housing. So, for the 90% of the time (unless I'm anchored in a wickedly strong current..which brings up other issues), I'd need another power option. Solar will work whenever the sun shines...boat moving or not. Now, the sails may block some sun...but I think the overall amount of time I could generate power would be much higher with solar than the shaft driven generator. I also like solar on the KISS principle. Solar has no real moving parts to break. Now, if the 90% and 10% were reversed...or even closer to equal, this may hold more promise. Guess it all depends on what your goals are. As for the checklist...I had a mental one but let them distract me from completing it. Fortunately, like all good checklists...there were redundancies and I caught the error while checking everything in the water and before the straps were released. Wasn't thinking as replacement to solar only as a supplement. And yes much better for long distance voyagers. In case you are interested later, Article was in website justalittlefurtherdotcom with parts1 and 2. Wildbluepowerdotcom makes the generator. Ah, OK. Thanks Doug. Definitely something to consider down the road.